DDFT - what is it? Does tension in the DDFT (or deep digital flexor muscle) contribute to laminitis? It has been suggested that the DDFT exerts a force on the coffin/pedal bone, so that when laminar connections at the toe are weakened or destroyed by laminitis, the pull of the DDFT is what causes the coffin/pedal bone to rotate. However this doesn't appear to explain why the coffin/pedal bones of horses with damage to the laminae all round the foot sink with the bone usually remaining parallel to the ground and in alignment with P1 and P2. "I believe that the weight of the horse on the pedal bone is more important than the pull of the deep flexor tendon so that it is more important to trim the feet of chronic founder cases with a ground-parallel pedal bone and that raising the heel to decrease the tension in the DFT is more likely to lead to continuation of the distortion and instability in the feet. The toe must always be taken back to allow breakover without pulling the dorsal wall away from the pedal bone." "CONCLUSIONS AND POTENTIAL RELEVANCE: The models in this study predict that raising the palmar angle increases the load on the dorsal laminar junction. Therefore, hoof care interventions that raise the palmar angle in order to reduce the dorsal lamellae load may not achieve this outcome." "Reasons for performing study: Previous studies have implicated tension in the deep digital flexor tendon (DDFT) in the rotation of the distal phalanx (DP) after the breakdown of the dorsal laminae caused by laminitis. However, once the DP has rotated, the DDFT should become shorter, reducing the force it exerts on the DP." "Conclusions: DDFT force in Group 2 laminitic ponies was much reduced until late stance, when it neared normal values." Raising the heel, and in extreme cases, cutting the DDFT (a procedure called tenotomy), supposedly to reduce tension in the DDFT and prevent or realign rotation of the coffin/pedal bone, is recommended by some and condemned by others. Could it be that raising the heels long-term, or not trimming the horse's heels to achieve a (near) ground parallel solar aspect of the coffin/pedal bone (i.e. not realigning rotation) at the earliest opportunity, allows the DDFT to contract? So that it is perhaps an effect of rotation rather than a cause? Does deep digital flexor tenotomy (surgically cutting the DDFT) have a place in laminitis rehabilitation? Abstract OBJECTIVE: To determine long-term prognosis for horses with laminitis treated by deep digital flexor (DDF) tenotomy and to identify factors affecting success of the surgical procedure. ANIMALS: 35 horses with laminitis treated by DDF tenotomy between 1988 and 1997. PROCEDURE: Information was obtained from individual medical records and follow-up telephone interviews with owners and referring veterinarians. Cumulative proportions of horses that survived 6 months and 2 years after tenotomy were determined. Effect of Obel grade of lameness on 6-month and 2-year survival and effect of distal phalangeal rotation on survival and future performance were evaluated by chi 2 analysis. Body weights of horses that survived > or = 2 years were compared with those of horses that survived < 2 years by ANOVA. RESULTS: 27 of the 35 (77%) horses survived > or = 6 months, and 19 of 32 (59%) survived > 2 years. Obel grade of lameness and body weight at time of surgery had no effect on 6-month or 2-year survival. Degree of distal phalangeal rotation had no effect on 2-year survival or the ability of horses to be used for light riding. Twenty-two of the 30 (73%) owners interviewed indicated they would have the procedure repeated on their horses given similar circumstances. CLINICAL IMPLICATIONS: DDF tenotomy is a viable alternative for horses with laminitis refractory to conventional medical treatment. In some instances, the procedure may be effective in returning horses to light athletic use. "Deep digital flexor tendon transection at the mid-metacarpus was performed in 20 horses with severe acute or chronic laminitis that was not responsive to conventional treatment. Sixteen horses improved within 72 hours, one horse worsened, and two horses were unaffected by the surgery. Eleven horses survived less than 1 month after surgery and six horses survived longer than 6 months. Three horses surviving longer than 6 months have remained lame and no horse has returned to athletic performance. Transection of the deep digital flexor tendon at the mid-metacarpus may decrease the pain associated with the acute refractory stage of laminitis and may be useful as an immediate salvage procedure; however, despite the early clinical improvement observed after tenotomy, the survival rate of affected horses may not be altered." "Thirteen horses with chronic refractory laminitis were evaluated and treated. In each horse, deep digital flexor tenotomy was performed on all affected limbs at the level of the midpastern. Five horses returned to limited athletic endeavors, 6 horses improved and were comfortable on pasture, 1 horse improved clinically, but was euthanatized for economic reasons, and 1 horse improved, but deteriorated 9 months after surgery and was euthanatized. Results of this study indicated that deep digital flexor tenotomy at the level of the midpastern can be used effectively as a salvage procedure in horses with chronic refractory laminitis." Massaging the deep digital flexor muscle may be of benefit to horses with laminitis, particularly before/after realigning trimming to lower heels, and may help prevent/reduce tension in the deep digital flexor tendon. See also Combined Dexamethasone Suppression/TRH stimulation test. The dexamethasone suppression test (DST) was once considered the "gold standard" method of diagnosing PPID. However, this appears to have been based on research by Dybdal et al. published in 1994, which is now considered to have been "favourably biased" (see below). The resting ACTH blood test is now the test of choice for diagnosing PPID, has several advantages over the DST, and is the test recommended by The Laminitis Site. The DST (sometimes called Overnight DST) involves collecting blood to test baseline cortisol in the late afternoon, then injecting 40μg/kg dexamethasone (20 mg/500 kg horse), then collecting a second blood sample to test cortisol the following morning, approximately 19 hours later. 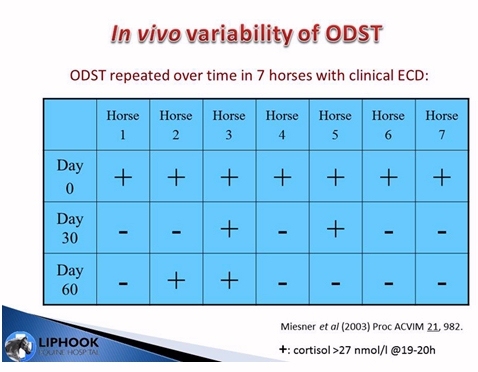 A normal horse should suppress cortisol following dexamethasone administration, and should have a post-dexamethasone cortisol concentration of < 27nmol/L (or <1 μg/dL or ~<30 pmol/L). Therefore a post-dexamethasone cortisol concentration greater than this is indicative of PPID. There may be a risk of exacerbating laminitis. It will increase hyperinsulinaemia transiently. Initial trials of the DST were diagnostic in horses that had advanced clinical disease - is there any evidence that the DST is sensitive for early PPID cases (see Beech et al. 2007 below)? False positive results may be seen in the autumn and therefore the DST should be avoided during this time (July to October is suggested as months to avoid using the DST by Liphook). The DST requires two vet visits and is therefore more expensive than the basal ACTH blood test. According to Schott 2006 (below), no diagnostic or prognostic information is gleaned from the basal cortisol test - so why is this done? "Results of DST were abnormal only in clinically abnormal horses or those with pars intermedia hyperplasia, but were within reference range in 17 of 26 tests in these horses." "The DST was specific but not sensitive and was inconsistent for individuals, and results often did not agree with the TRH test response." Results of overnight dexamethasone suppression test repeated over time in horses suspected of having equine Cushings disease. J Vet Intern Med 18, p 420. In 2003 Miesner et al. used the overnight dexamethasone suppression test three times 30 days apart on 7 horses showing clinical signs of PPID. Only 1 of the 7 horses tested positive for PPID in all three tests. 4 of the 7 horses did not test positive for PPID after the initial test, despite showing clinical signs of the disease. This suggested that the test was inaccurate in early cases of PPID (but they weren't that early - they had clinical signs! ), and that the sensitivity of the test was lower than had originally been suggested. Diagnostic testing for pituitary pars intermedia dysfunction in horses. Dybdal NO, Hargreaves KM, Madigan JE, Gribble DH, Kennedy PC, Stabenfeldt GH. "On the basis of plasma cortisol concentration, the dexamethasone suppression test, using 40 micrograms/kg, whether initiated at 5 PM with sample collection at 15 (8 AM) and 19 (12 PM) hours after dexamethasone administration, or initiated at 12 AM with sample collection at 8 (8 AM), 12 (12 PM), 16 (4 PM), 20 (8 PM), and 24 (12 AM) hours after dexamethasone administration, reliably distinguished between control horses and those with pituitary pars intermedia dysfunction." According to the study, the ODST showed 100% sensitivity and specificity and was subsequently used as the "gold standard" test for diagnosing PPID. However, the horses were selected based on the presence of obvious clinical signs of PPID, including hirsutism, which is considered to be diagnostic for PPID, and is now thought to be a symptom of advanced PPID. It is possible that the loss of dexamethasone suppression happens late in the progression of PPID, and that the ODST is inaccurate for diagnosing early cases of PPID. 19 hour overnight DSTs were carried out in April, July and December on 6 normal and 6 previously laminitic ponies kept at grass. Effect of a single dose of dexamethasone on glucose homeostasis in healthy horses by using the combined intravenous glucose and insulin test. A single IV dose of 20 mg dexamethasone (the dose used for the DST) decreased the response to insulin at 2 and 24 hours. 19 hour DSTs (0.04 mg/kg dexamethasone) were carried out in August on non-obese previously laminitic ponies (LP) and control ponies. The previously laminitic ponies had exagerated production of insulin in response to the DST. The lowest serum insulin concentration after dexamethasone administration in LP ponies was 83.6 mU/L, and the highest was 488.3 mU/L. Conclusion: "In horses, 21 days of dexamethasone treatment resulted in substantial insulin resistance". In a balanced crossover study, 6 adult standardbred horses received dexamethasone (0.08 mg/ kg, IV, q 48 h) or an equivalent volume of saline (0.9% NaCl) solution (control treatment) during a 21-day period. "RESULTS: Mean serum insulin concentration was significantly higher in dexamethasone-treated horses than control horses on days 7, 14, and 21. Similarly, mean plasma glucose concentration was higher in dexamethasone-treated horses on days 7, 14, and 21; this value differed significantly on day 14 but not on days 7 or 21. Minimal model analysis of FSIGT data revealed a significant decrease in Si and a significant increase in AIRg after dexamethasone treatment, with no change in Sg or disposition index. Mean RISQI was significantly lower, whereas MIRG was higher, in dexamethasone-treated horses than control horses on days 7, 14, and 21. CONCLUSIONS AND CLINICAL RELEVANCE: The study revealed marked insulin resistance in healthy horses after 21 days of dexamethasone administration. Because insulin resistance has been associated with a predisposition to laminitis, a glucocorticoid-induced decrease in insulin sensitivity may increase risk for development of laminitis in some horses and ponies." When a horse has diabetes mellitus (DM), blood glucose levels are significantly higher than normal - this is called hyperglycaemia. DM happens when the horse doesn't make enough insulin, or the insulin doesn't work properly (insulin resistance). DM appears to be very rare in horses. In most horses with insulin resistance, increased amounts of insulin produced "compensate" for the insulin resistance and prevent blood glucose levels becoming abnormally high - unlike in humans, insulin resistance in horses doesn't usually develop into diabetes mellitus. Horses with insulin resistance have above normal insulin but normal glucose. Horses with DM have above normal glucose but normal/low insulin. High levels of glucose in the blood (>180/200 mg/dl) can lead to glucosuria - glucose in the urine. DM and hyperglycaemia are most commonly seen in horses with PPID. Diabetes mellitus is associated with persistent hyperglycaemia (above normal blood glucose levels) due to reduced production or reduced sensitivity to insulin. Type 1 or insulin-dependent diabetes mellitus occurs as a result of a primary insulin deficiency due to destruction of pancreatic beta cells (e.g. due to pancreatitis) and is reported infrequently in horses. Type 2 or non-insulin-dependent diabetes mellitus is the more common form and mostly reported in older horses with PPID. Diagnosis of T2DM is based on low insulin sensitivity/marked insulin resistance and low to no discernible insulin response (by pancreatic beta-cells) to glucose. Treiber et al. 2005 suggested that type 2 diabetes mellitus rarely occurs in horses; Durham et al. 2009 suggested that type 2 diabetes mellitus may be more common in horses than generally considered. (Theoretical reasons for T2DM to develop: chronic insulin resistance progresses into pancreatic exhaustion (as with humans. Hyperglycaemia may develop in horses with PPID due to high levels of cortisol - although above normal levels of cortisol are not commonly seen in horses with PPID. Therefore should PPID horses with hyperglycaemia have cortisol tested?). The clinical symptoms of diabetes are weight loss and PU/PD. Sometimes excessive appetite, depression and exercise intolerance are seen. Diagnosis of DM uses similar tests to insulin resistance: fasting resting insulin and glucose, euglycaemic hyperinsulinaemic clamp technique, frequently sampled intravenous glucose tolerance test, minimal model analysis of insulin-glucose dynamics. The Lloyd Guide to Insulin Resistance and Laminitis p 31 suggests that testing should be carried out for DM if resting fasting glucose > 120 mg/dl with insulin < 20 µIU/ml. Treatment of DM will depend on identifying an underlying cause - if one is found, that should be treated (e.g. PPID is treated with pergolide/Prascend). Otherwise there is currently no recommended standard treatment of diabetes in horses, and treatment should consist of medication, diet and exercise. Durham et al. treated 2 horses with T2DM with metformin (15 mg/kg PO every 12 hours). One horse developed clinical signs of hypoglycaemia after 10 days of treatment. Treatment was withdrawn, hyperglycaemia recurred, so treatment with metformin was re-introduced at 7.5 - 9.5 mg/kg PO every 12 hours and euglycaemia was reached. The other horse did not respond to metformin treatment after 22 days and oral glibenclamide (glyburide) treatment (0.3 mg/kg PO every 12 hours) was started. Expert advice should be sought. According to Phillip Johnson, the optimal diet for management of DM in horses is unknown, but a diet based on high fibre, low NSC and oil for added calories if necessary seems logical. "horses may develop type 2 DM as a result of IR and EMS, but DM is relatively uncommonly identified in the equine species". "OBJECTIVES: Three cases of diabetes mellitus were investigated using a specific test for insulin sensitivity and pancreatic beta cell function in order to define accurately and characterise the existence of T2DM in all 3 subjects. METHODS: The insulin-modified frequently sampled i.v. glucose tolerance test was performed in each case and the data so obtained were subject to minimal model analysis of insulin-glucose dynamics. Cases were then monitored following treatment using a combination of dietary modification, metformin, glibenclamide and pergolide. RESULTS: Marked insulin resistance was identified in each case and, furthermore, severe pancreatic beta cell dysfunction was present therefore classifying each case as end stage T2DM. Treatment was nevertheless associated with restoration of normoglycaemia in all cases. CONCLUSIONS: T2DM in horses may be more common than generally considered.In some cases individuals may respond to therapy aimed at restoring insulin sensitivity and pancreatic function. Drugs used in other species for the treatment of T2DM have not yet been adequately tested in horses. POTENTIAL RELEVANCE: T2DM should be considered as an important differential diagnosis in mature to elderly horses and ponies suffering from weight loss, polydipsia and polyuria. Clinicians should be encouraged to offer treatment and management advice when such cases are encountered." The most common biochemistry abnormality in a horse with PPID is hyperglycemia. "Although non-specific, when hyperglycemia is present in routine blood analysis of an aged horse, PPID should be considered." A mare with diabetes mellitus showed rapid weight loss, abnormal glucose tolerance and no response to insulin. Post mortem findings included a tumour in the pars intermedia, adrenal cortical hyperplasia and depletion of the beta cells of the pancreatic islets. A diet for a laminitic horse will depend on several factors including the cause of the laminitis, the severity of the laminitis (symptoms and blood results) and whether acute or chronic, whether the horse needs to lose or gain weight and its management, but in general a diet based on grass hay with adequate protein, minerals and vitamins, and perhaps omega 3, will be suitable. NEVER STARVE A HORSE, PONY OR DONKEY WITH LAMINITIS - this can cause hyperlipaemia which can be fatal - unless a competent vet says otherwise, always feed at least 1.5% of the horse's bodyweight (in dry matter), so a 500 kg horse will need 7.5 kg of dry food - which would be 8.25 kg of a hay that was 10% water. 1.5 - 2% horse's bodyweight in grass hay, ideally analysed and with an NSC content of < 10%, otherwise soaked (see hay soaking). .
Low sugar/starch chaff e.g. Dengie HiFi Molasses Free or HiFi Lite, or unmolassed (rinsed/soaked/rinsed to remove iron/sugar) sugar beet (USA: beet pulp) to carry minerals. Micronised ground linseed (USA: flaxseed) approx. 50 g/day for a 500 kg horse to replace omega 3s found in grass. grass, cereals, feeds with > 10% combined sugar and starch, highly molassed feeds, treats. Remember you don't count water content when calculating how much a horse needs to eat - diet is calculated on a Dry Matter (DM) basis. Hay is often around 10% water, so if your horse weighs 500 kg and doesn't need to lose weight, and you want to feed 2% of his bodyweight (2% BW), that would be 500 kg x 2% = 10 kg hay DM, or 10 kg x 1.1% = 11 kg hay as fed. Remember to weigh hay before soaking it. Haylage is generally suitable to feed to horses with laminitis, especially high fibre or Timothy varieties that come with an analysis - combined sugar and starch is often 5% or less DM. Haylage has a higher water content than water and is often around 55 - 60% DM (so 45 - 40% water). To feed 10 kg DM of 60% DM haylage, you would feed 10 kg/60% = 16.6 kg as fed. Soaking haylage is not recommended because there is a risk of secondary fermentation, and soaking to further reduce sugar content shouldn't be necessary with correctly made haylage. Tips for feeding, access to pasture and exercise for the laminitis-prone horse. Horses with laminitis will often have a "bounding" digital pulse (the pulse in the digital artery in the lower leg), and checking the digital pulse can be one of the best ways to detect if a horse has or is developing laminitis (or another problem in the foot e.g. an abscess or bruising). It's also an easy place to measure a horse's heart rate. The digital pulse is measured with your finger/s, on both the outside and inside of each leg, on the fetlock or on the pastern. ​​Learn to check the digital pulse before you need to - it's much easier to learn when you aren't worrying that your horse is ill. Ideally ask someone who is confident checking the pulse to show you exactly where to put your finger - put your finger above or below theirs on the artery and count the pulse together to be certain you are feeling the right thing. Watch this video, or look at the diagrams in the links below, to see where you should feel for the pulse, then lightly move your finger around this area until you feel something like a fairly firm strand of spaghetti. Put your finger over this "strand of spaghetti" and, if necessary, vary your finger pressure until you can feel a pulse. To check the heart rate, count the pulse for 15 seconds then multiply by 4 (or for slightly more accuracy count for 30 seconds then multiply by 2). You might double-check the digital pulse against the mandibular artery pulse (near the lower jaw bone) until you are confident. When looking for signs of laminitis or other foot problems, it is the "boundingness" or strength of the pulse that you are assessing - a really bounding pulse can move your finger. To be able to assess this, you have to know what is normal, and how your horse's digital pulse varies - normally - through the day. In a healthy foot on a calm horse standing on soft ground, the digital pulse can be hard to find, but exercise, heat, excitement and hard surfaces can make the digital pulse more bounding and easy to find. (Note that a horse with laminitis or suspected laminitis should never stand on a hard surface - feet should be well cushioned and supported with pads and/or conforming bedding/ground at all times). To help assess whether a more bounding digital pulse indicates a foot problem or something affecting the whole body, check the mandibular artery pulse too - if only the digital pulse is bounding, this may be more suggestive of a foot problem. ​Practise taking the digital pulse at every opportunity, and on lots of different horses (as long as you can do so safely!). It's a skill a bit like riding a bike - it can take a few tries to get it right, but once you've got it you'll always be able to find the pulse, and you could make a real difference to a horse by identifying a potentially serious problem early. According to Pete Ramey (Care and Rehabilitation of the Equine Foot p 358), "sudden and dramatic" distal descent of P3 is rare but can occur when acute laminitis completely destroys the laminar attachments and the hoof is peripherally loaded (by shoes/long walls). The risk of distal descent can be lessened by reducing the weightbearing role of the walls at the first sign of laminitis, by trimming and bevelling the walls and/or using thick padding. When such distal descent does occur, the walls should be completely removed from weightbearing and thick foam padding and boots used to support and protect the sole, frog and bars. Domperidone, a synthetic benzimidazole, is a dopamine receptor antagonist which blocks peripheral dopamine D2 receptors, thereby increasing the release of POMC-derived peptides, including ACTH, alpha-MSH, beta-endorphin and CLIP. Domperidone is approved for treating endophyte-associated agalactia in mares. "The change in ACTH concentration after domperidone administration was less consistent in differentiating clinically normal horses from those with PPID than was the response to TRH." (NB it is likely to be sugar in the grass, not fructan, that increases the risk of laminitis. In research, fructan has not increased insulin levels significantly. Always check the sugar and starch content of bagged feeds with the manufacturer if this information is not on the bag/website - some High Fibre feeds contain sugar and starch levels in excess of 15% and are therefore unsuitable for equids with EMS/insulin dysregulation. Claims that feeds are suitable for laminitics or approved by laminitis charities should be ignored - always check the facts and figures, not marketing statements). ACTH was measured in 422 donkeys admitted to The Donkey Sanctuary, UK. A distinct seasonality in ACTH was noted, with lower values Nov - June (median 17.8 pg/ml) than July - Oct (37.9 pg/ml) in non-obese & not laminitic donkeys. A reference range of 24.7 pg/ml was established. ACTH was measured in 126 donkeys admitted to The Donkey Sanctuary, UK. However no indication is given as to the month the blood samples were taken therefore it is not known whether the seasonal rise in ACTH was taken into account. Donkeys are particularly susceptible to hyperlipaemia (usually caused if the donkey stops eating for any reason). In the healthy horse, dopamine inhibits the production of hormones from the pars intermedia. Dopamine is released into the pars intermedia from dopaminergic neurons (tuberoinfundibular dopamine neurons) that originate in the hypothalamus. The dopamine binds to dopamine (D2) receptors on the surface of the melanotropic cells of the pars intermedia, rather like putting a key in a lock. Once the dopamine is bound to the receptor, the production and release of POMC hormones (α-MSH, β-endorphin, CLIP and ACTH) is inhibited. PPID is considered to be a dopaminergic neurodegenerative disease - the lack of sufficient dopamine leads to increased POMC hormone production and release. The reduction in dopamine also causes hyperplasia and hypertrophy of the cells of the pars intermedia, leading to adenomas and causing the pars intermedia to increase in size. Dopamine also inhibits prolactin, growth hormone (GH) and thyroid-stimulating hormone (TSH) secretion in the pars distalis. Dopamine and dopamine agonists (Pergolide, Bromocriptine) inhibit POMC secretions from the pars intermedia (Orth et al 1982). Horses with PPID had a 5-fold reduction in the number of dopaminergic terminals in the pars intermedia compared to age controls. Pergolide is a dopamine agonist used to treat PPID in horses. "We conclude that dopaminergic agents have no benefit for treating insulin insensitivity in horses, in spite of a perception of such benefits permeating the industry."